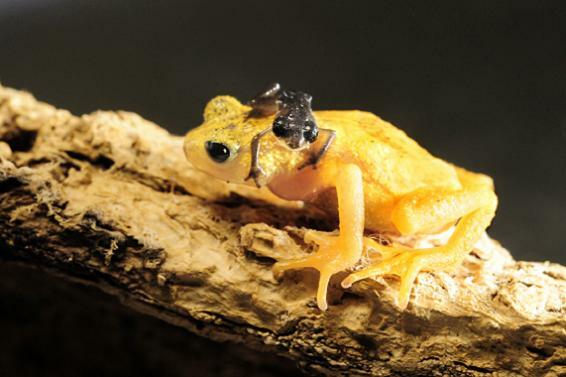 The Bronx Zoo has a put a most unusual frog on display: the Kihansi spray toad. For one thing, the Kihansi spray toad survived on only 5 acres in the Kihansi gorge in Tanzania, adapted to the areas’ unique and constant mist from the gorge and a waterfall. For another, female Kihansi spray toads give birth to live young, instead of laying eggs. Finally, the Kihansi spray toad is extinct—at least in the wild. Prior to its extinction, 499 toads were taken from their tiny habitat and brought to American zoos, including the Wildlife Conservation Society’s Bronx Zoo. Herpetologists at the zoo have working for nearly a decade on saving the frog with plans to reintroduce it back to its habitat. “The Wildlife Conservation Society is taking a leading role to ensure this toad does not disappear from the planet by playing an active role in its conservation,” said Jim Breheny, WCS Senior Vice President of Living Institutions and Director of the Bronx Zoo, in a press release. 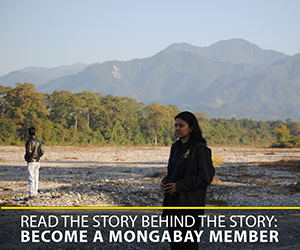 In 2000, the construction of a hydroelectric dam, funded by the World Bank, diverted the river’s flow and dried up the Kihansi spray toad’s habitat by 90 percent. Within a number of years ths lose of habitat combined with the arrival of chytrid fungus—which has devastated amphibian populations worldwide—led to frog’s extinction. Researchers have set-up sprinkler systems on the frog’s former habitat in an attempt to recreate their unique microclimate and hope to attempt a reintroduction plan soon. The Kihansi spray toad was unknown to science until after the dam’s construction, which provides one third of Tanzania’s current energy needs. Kihansi spray toad and toadlet. Photo by: Julie Larsen Maher. (11/04/2009) This year’s IUCN Red List has updated its assessment of the Kihansi spray toad, moving the species from Critically Endangered to Extinct in the Wild. With that another amphibian species has been lost to a combination of habitat loss and the devastating amphibian disease, the chytrid fungus. The Kihansi spray toad Nectophrynoides asperginis, which still survives in a number of zoos in the United States, had lived on just two hectares along the Kihansi gorge in Tanzania. The toad was specially adapted to the spray region of the Kihansi waterfall, which kept its small environment at a constant temperature and humidity. (06/29/2005) Following the construction of a dam in Tanzania, the Kihansi Spray Toad sits on the brink of extinction. Scientists are racing to study the amphibian for bioactive compounds with potential medical applications.